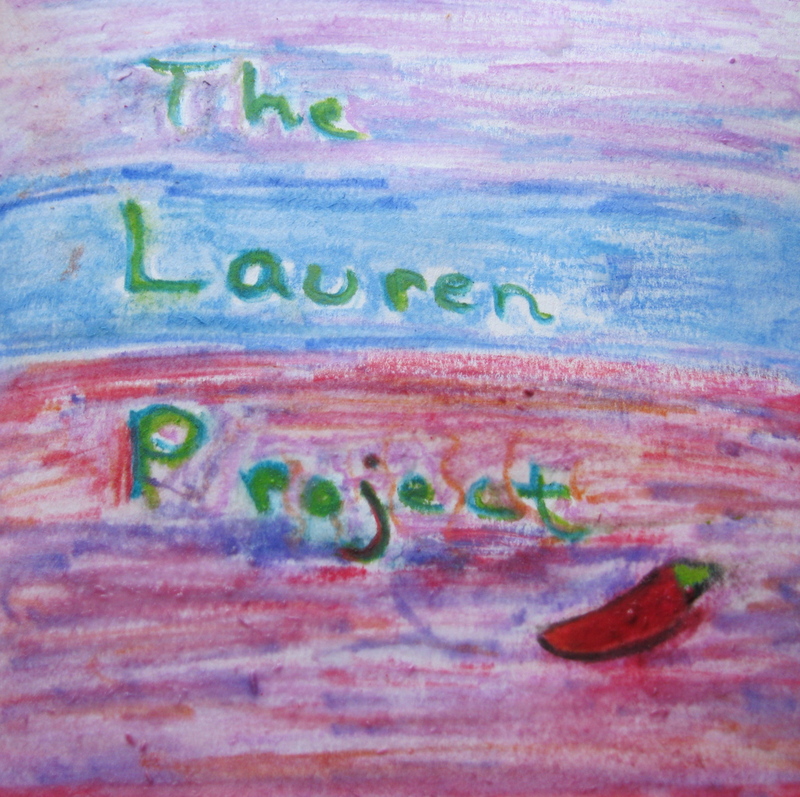 The Lauren Project. 6 ” x 6″ watercolor pencil on paper. Sharyn Dimmick. Welcome to The Lauren Project. You have until midnight Pacific time on August 31st to post your suggested recipes for Lauren. Please use the Comment section to post your submitted recipes. All posted recipes must follow Lauren’s current dietary guidelines (See the “Yes” food list and the “Must avoid” list below). In a heavy Dutch oven, heat the olive oil. Sauté the shallots and garlic until just starting to brown. Add the spices and stir to mix well. Add the lamb and brown, then sauté, stirring occasionally until nearly cooked through. Add the squash and chickpeas and perhaps 1/2 C water. Cover and simmer until the squash begins to soften. Add the currants and continue to cook until the squash is soft but not mushy. If it seems to “wet”, cook uncovered to dry a bit. Serve over rice if desired with a dollop of yogurt on top. This is better the second day and freezes well. *I* think it is breakfast-y… it is a bit “sweet”. I make it with sweet potatoes but I thought maybe those counted as potatoes… if they are permitted, try it that way! Note: no salt in this recipe but you can add it to taste. I just usually don’t bother with it! Rachel, this looks amazing! I can’t wait to try it out (hopefully this weekend). Coriander is totally fine, just not one I think of often, so forgot to add it to the list. Would the currants be dried? I guarantee your house will smell wonderful! Mmmmm… please let me know what you think! Thanks, Rachel! I’ll tell Lauren the first recipe is up — she’ll probably reply shortly. It may not fit all of your requirements to the letter, but it’s close and could be easily adapted to fit perfectly. Thanks, Will. I’ll have Lauren take a look at it. Put the quinoa in a fine mesh strainer and rinse under the sink (I find that most of quinoa has already been rinsed quite well, especially alter-eco). Add 1 cup quinoa and 2 cups water to a small pan and simmer until all water is absorbed. (At altitude you may need to add a bit more water. Keep watching it so it doesn’t burn). It will be done after 15-20 minutes when there is a little white thread around the outside of the grain. Add quinoa to a bowl. Add raisins, dates and brown sugar on top, and pour almond milk over the top (Just like oatmeal). You can make the quinoa ahead of time and reheat each morning. Thanks, Suzanne. Lauren should see this shortly. The original uses cucumbers, but you can replace the cucumbers with zucchini or other summer squash. Serve with quinoa/rice and topped with baby spinach wilted in a pan for about 1 minute with a little olive oil, lemon juice and salt. Melissa writes for the NY Times and I’ve never made a recipe of hers that wasn’t great. All of her cookbooks are amazing, but I’m really into “Cook this Now”. There are lots of great suggestions on substitutions since her husband is allergic to dairy. I think butter is ok, but let me know if not. Butter is fine, Suzanne. Thanks. I’d like to recommend this delicious lentil and swiss chard soup. Easy to cook and makes enough to chill and eat later. Heat the oil over medium heat. Saute the onion and garlic until soft, about 5 min. Add broth, lentils, water; bring to a boil. Reduce heat and simmer (covered) for about 45 min. or until lentils are tender. Add chard, cilantro, cumin, salt, pepper; cook until the chard wilts, about 5 more min. Remove from heat, stir in lemon juice, serve with lemon zest and cilantro garnish. Even better the next day. Oops. No onion. Substitute shallots or try again. actually garlic is cool. just no onions. No reason shallots couldn’t be used instead! Roasted Zucchini with Shallots: Chop a shallot very fine and toss with chunks of zucchini and a slosh of olive oil. Sprinkle a spice on it, too. Roast in a shallow pan in a 400 degree oven for 20 minutes or more. (Our oven’s temp is deeply unreliable, so I don’t have exact times.) Stir occasionally. When golden, remove and eat . Also works with pretty much any vegetable — especially delightful with tiny Brussels sprouts, medium/large halved sprouts, broccoli, carrots, winter squash, or cauliflower, which turns into ZOMG tasty when roasted. You can also roast a blend of veggies this way. Sprinkle with sea salt, fresh-ground pepper, and/or your favorite spice mix. Devour. These are excellent paired with any grain you can eat. You won’t miss meat — at least, I don’t. But if you want some meat, you can roast a piece of chicken or fish or whatever at the same time. Quarter the zucchini and chop into quarters about 1/4-1/2″ thick. Cut corn off the cob (or remove from bag if frozen). Dice the shallot and the garlic. Warm the oil in a pan on medium low heat and add the onion and garlic. Cook until the onion is translucent (3-4 minutes). Increase heat to medium and add the zucchini and a dash of salt. Cook until the zucchini is soft and brown (about 20 minutes). Add the corn and saute for a few minutes. Add about 1/4 cup of water and put the lid on the pan. Cook for 5-10 minutes until calabacitas are fairly soft. Salt and pepper to taste. (You can double or triple this and store this in the refrigerator until for several days). I heat my tortillas briefly in a sandwich press, but you can also heat them in a microwave or on the range. Put them between clean tea towels or two plates to keep steaming while you scramble. Add 1 tablespoon olive oil to frying pan on medium heat. Crack the eggs into a bowl and mix quickly with a fork. Scramble quickly in a pan for 1 minute. Put two tortillas on a plate, add about 2 tablespoons of calabacitas, 1 egg and a little cheese to each. Add salt and pepper. Addition: You can add a little sausage if you need protein. Non-allergy note: I also add guacamole and/or salsa for those that can eat it. Wow, you are really going to town, Suzanne! Thanks. 2. Put enough olive oil on salmon to make it a little moist. 3. Sprinkle the turmeric over the salmon. Apply more olive oil if necessary to get the turmeric to the consistency of a paste. Spread turmeric with finger to make sure it mixes with oil. Plaintains are out, Rachel. Sorry. yucca if cooked is probably okay in small doses. jicama is a little too dicey. Soak the beans overnight, covering with a couple inches of water. Strain out the water. In a crockpot, add the beans, 2 cloves garlic (sliced), and 1 shallot diced finely and cumin. Cover with water and cook on low until beans are done (this will take 5-6 hours on low). After the beans are done, salt to taste. You might want to check every now and then until you get the water amount right — it’s sort of trial and error based on how old the beans are and the kind of crock pot you have. Steam the tortilla on a sandwich press, on the stove or microwave and put in a tea towel or between two plates to keep steaming. In a frying or saute pan, heat the olive oil on medium and swirl around the pan. Add the last thinly sliced garlic clove and wait about 20 seconds. Add the baby spinach and wilt (don’t overcook). Add beans and spinach to tortillas. – I’ve found that it is important not to salt at high altitude until after the beans are cooked. Otherwise they will never cook. – For those without allergies you can add epazote, mexican oregano and (my favorite) smoked paprika to the black beans while cooking. – I like the crock pot method for cooking beans at altitude better than the pressure cooker. Plus if you make extra you can have them all week. – You can also add salsa to the tacos if you aren’t allergic to tomatoes, chiles or tomatillos. – You can mash the beans roughly with a fork if you like them to have a creamier consistency. In a frying or saute pan, heat the olive oil on medium and swirl around the pan. Add the last thinly sliced garlic clove and wait about 20 seconds. Add the baby spinach and wilt (don’t overcook) and squeeze a bit of lemon on top. This is from the awesome book “Lebanese Cuisine” by Madelain Farah. It sounds really basic, but the key is to get the shallots or onions really carmelized to flavor the lentils and rice. Rinse lentils and place in a pan with water. Bring to a boil and then simmer for 20 minutes uncovered until cooked (but not mushy). Keep an eye on the lentils… the timing will vary based on how old they are and what kind you use. Meanwhile saute the onions on medium heat in the oil until they are carmelized. Keep a close watch on them and stir often to ensure they don’t burn. This could take 10-20 minutes. After onions are done and the are lentils almost cooked, add the rice and the onions/oil to the lentils. Bring to a boil and then lower the heat. Cover and cook for approximately 20 minutes (this time will vary with altitude). Add pepper, cumin and salt (to taste). – I’ve seen recipes for this where you cook the lentils at the same time as the rice, but I’ve found that at 7000 ft, you really can’t do this. The lentils often take longer to cook than the rice. – Serve with a side of yogurt spiced with ground cumin. – If you use a lot of shallots, err on the side of more olive oil to carmelize. For Lauren, if you use just one large shallot you can move to the low end of the spectrum on the oil. It sounds like a lot but you need it to carmelize the shallot nicely (it takes a good amount of oil to do this) and integrate with the lentils. It makes a lot of Mjadra so you will be eating it for days. If you add more chicken and greens this gets heartier, more wintery and stew-ish. Have fun with proportions and let me know what you think! Mmmmm…. In a large heavy Dutch oven, heat the olive oil, add the shallots, garlic and fennel, and let caramelize over very low heat. Then add the kale and 1/4C of the chicken stock. When it cooks down, add the rest of the stock. Bring to a boil, reduce heat and simmer 1/2 hour. Add the chickpeas and beans, cook 1/2 hour more, check for salt/pepper as needed. (*Add any leftover chicken. Simmer for another 15 minutes.) When you turn the heat off, add the sage and stir in well. Hi Sharyn and Lauren, here’s my penny worth – I plan to blog it but I mucked up taking a photo of the Mackerel before it was cooked – it is so beautiful and I want the photo to illustrate my blog, so I’m off to buy another tomorrow and cook it again, this time for my lunch !! well I thought it was delicious 🙂 And if you can’t get mackerel any oily fish is good. •	Heat the oil in a wok or large frying pan and when hot add the seeds (mustard, cumin and fenugreek) and the curry leaves, let them sizzle in the oil for 30 seconds. •	Now add the ginger, garlic along with the turmeric powder and stir it in. •	When the coconut is well dissolved and mixed in, add the mackerel to the pan, and stir gently. •	Bring the contents of the pan back to a simmering point and add the tamarind paste, stir this into the sauce. •	The fish shouldn’t take long to cook, maybe 5 minutes in total. I take a piece and check it to see the colour of the flesh. •	You may need to add more water if the sauce is getting too thick, add a bit at a time. I also add a pinch of salt towards the end, I ‘ll leave that decision to your taste buds. I heat up a drop or two of vegetable oil in a pan, add a teaspoon of mustard seeds, and half a chopped onion, when the onion is nearly cooked (translucent) I add some garlic and ginger, give it a stir and then add my rinsed cleaned and chopped chard, a tablespoon of water and a pinch of salt. I then put a lid on the pan (wok), turn the heat down and let it steam/cook for about 3 minutes until the chard is wilted and cooked – but not over-cooked! We ate this, well I ate the fish curry, my OH had a teeny taste (he’s veggie) with a simple pilau flavoured with black peppercorns, cloves, a bay leaf and a couple of cardamom pods. Heat 2 teaspoons butter in a large non-stick skillet and add carrots and celery. Saute for 5 minutes on medium-low heat. Cover and heat for 5 minutes more on low heat. Push vegetables to one side of skillet. Coat fillets with flour (or just pat them dry). Turn heat up to medium and saute fillets in the remaining 1-2 teaspoons butter until lightly browned, turning carefully with a spatula. Season with salt, pepper & lemon rind. Cover and cook over low heat about 5 minutes more, or until the carrots are tender and the fish is cooked through. Serve with the lemon wedges, to squeeze lemon juice over the fillets. Thank you for your submission. It’s really fun to see what comes in. This is in response to Lauren’s wish for one-pot dishes that can be cooked simply in quantity, then frozen. I used a standard upright 4 quart crock pot. For a larger pot, you may have to add a bit more liquid. Cook on high unless you have one of those super-atomic crockpots. Place frozen chicken in pot first. Sprinkle cardamom and cloves on chicken surface, then add garlic and ginger on and near the chicken. On the sides add the beans or corn, then squash near the top layer. Put a little liquid at the side, but don’t overdo or let the spice wash off the chicken. You want the chicken to cook without much liquid, and it will produce its own broth as it cooks. Cook 4-6 hours on high. Dice or shred chicken in pot and mix to distribute flavors. You can re-spice at the end to taste. Serve with a dollop of yoghurt in the bowl and salt to taste. Freezes well. Keep zucchini at the top and it won’t overcook even with hours in the crock pot. Smells divine! I am going to try this one, Suzanne, perhaps without the zucchini (maybe with butternut squash in the winter). I frequently combine brown rice, black rice, wild rice and quinoa, together with beans. Cook using only water or broth. I prefer to use just water. Freezes well. Since you made the salmon with turmeric, I thought I’d throw you another one. I go with a turmeric theme as I’m South Indian and we’re a turmeric eating people. Medium carrots (not sure how thick a carrot can be and still cook right. Medium ones work well. If thicker ones don’t, cut them up into smaller pieces. Black pepper and salt (can skip if you can’t eat black pepper and/or salt. 2. Cut off tip and knob (where greens sprout off) of carrots. 5. Roll oiled carrots in turmeric.Get to where carrot is coated with a layer of turmeric dust. If the turmeric won’t stick, add more oil. About 1/4 teaspoon of turmeric per carrot will due. 6. Roll carrots again in salt/pepper mixture. I use about 3 parts pepper for 1 part turmeric and a pinch of salt. Adjust for taste. If it won’t stick, add more oil. 8. Bake at 425 degrees for 40 minutes. The cooked carrots will shrink, soften and be a little blackened. They will taste a little sweet, which contrasts nicely with the spiciness of the turmeric and pepper. They make a nice side dish. If you want to serve smaller pieces, cut the carrots before cooking. I tried eating this in a hotdog bun once. The bread neutralized the spiciness of the turmeric. The carrots, though, went pretty well with spicy mustard. So if you want to make a carrot dog, cut the carrots to hotdog bun size, bake nekkid without turmeric or pepper, and serve with mustard. A baked carrot without anything is a little sweet. I don’t like it alone, as when I like something sweet I like it sweeter than that. But if you have trouble with honey and sugar and want something sweet, you might want to try just backing a carrot alone. Good morning everyone. Thank you so much for all the recipes! I am in the process of cooking all of the wonderful food and look forward to working with Sharyn to award the prizes.